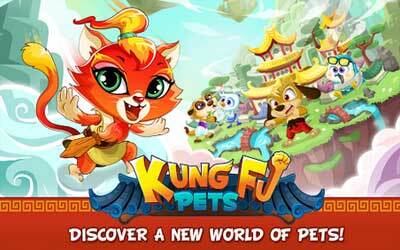 Kung Fu Pets 1.2.4 APK is updated, if you get some problems in the previous version it’s better to update your app. This version fixed some issues in the old app. Maybe you’ve heard the movie Kung Fu Panda. Well, the game is about you have pets and train them to become Master and against your friends. In playing this game, you are the teacher of this pet. Train them day and night so that they are good and ready to fight your friends. This game uses a nice view, like Humanoid Animal in the movie Kung Fu Panda. Through this game, you will meet with an animal that you can train to be a great hero. More interestingly, you will be able to combine several different types of animals to obtain a new type of animal. After that, you can use it to compete with your friends through social features offered. Summon new Kung Fu Pets through unique combinations and fight battles against friends to dominate the Tournament! Fight against the evil forces to bring peace and harmony back to Xiaolin! COLLECT unique Pets through tons of combinations! Mix and match different elements types to summon new pets! RAISE your Pets from adorable babies into masters! Train and feed your Pets with gourmet meals to help them evolve through 3 stages! FIGHT in strategic battles according to element types and strengths! Create a team and challenge other Masters in the arena! BUILD a mystical village in the sky! CONNECT with your friends! Share gifts and battle players around the world! New Auto Battle Mode has been added. You can now shorten the Social Battle Cooltime with Gems. New Order All and Complete All functions have been added to the Bistro. The update is great and my game is working really good as well.